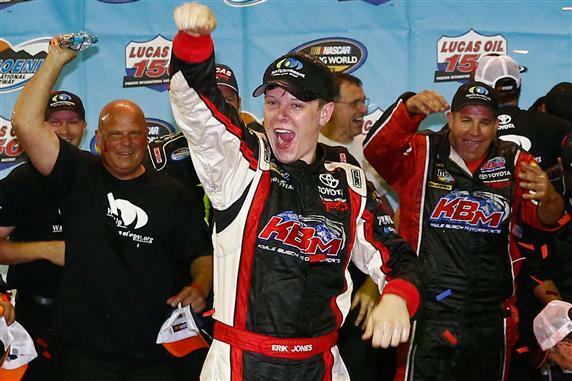 AVONDALE, Ariz. — In a battle between two drivers who had never won a NASCAR Camping World Truck Series race, 17-year-old Erik Jones pulled away from Ross Chastain in the final 10 laps of Friday night’s Lucas Oil 150, becoming the youngest winner in series history. Driving the No. 51 Kyle Busch Motorsports Toyota, Jones took the lead on Lap 142 of 150, powering to the inside of Chastain through the dogleg on the backstretch. Born May 30, 1986, Jones eclipsed Chase Elliott, a winner earlier this year at Canadian Tire Motorsport Park, as the youngest winner in the truck series. With a fifth-place run, Matt Crafton moved closer to the series championship, ending the evening 46 points ahead of Ty Dillon, who finished fourth. To secure the title, Crafton has to only start Friday’s race at Homestead-Miami Speedway. James Buescher, who entered the race second in points, came home ninth and was eliminated from championship contention. Veteran Brendan Gaughan ran third behind Jones and Chastain. Jones and Chastain swapped the lead through a series of late-race cautions before Jones made the winning pass and pulled away. After the final restart on Lap 141, Chastain blocked a strong run by Jones at the top the track, a move that made Jones all the more determined to win the race. “On the last restart, we stayed with him through (Turns) 1 and 2 on the top side,” Jones said. “He squeezed us up — but that’s racing with 10 to go. You can’t blame him for that. But when something like that happens, it makes you more determined than you were before. Jones lost the lead to Chastain during pit stops under caution on Lap 89, the yellow flag necessitated by Ron Hornaday’s hard crash into the Turn 4 wall. After his release from the infield care center following the wreck that ended his race, Hornaday revealed that he had been released from his ride in the No. 9 NTS Motorsports truck and will drive for Turner Scott Motorsports in the season finale. As soon as the green flag waved, however, Jones powered to the outside of Chastain after a restart on Lap 94 and cleared the No. 19 by the time the trucks exited Turn 2. Jones opened a lead of 3.2 seconds before debris from Joey Coulter’s truck caused the fourth caution of the night on Lap 112. Chastain grabbed the lead from the inside lane after the Lap 120 restart moments before John Wes Townley’s spin into the outside wall caused the sixth caution. Chastain held the top spot on Lap 134, when Timothy Peters’ truck got loose beneath that of fellow Toyota driver Darrell Wallace Jr. and sent both trucks spinning. 1. (2) Erik Jones, Toyota, 150, $39110. 2. (1) Ross Chastain, Ford, 150, $34150. 3. (3) Brendan Gaughan, Chevrolet, 150, $18420. 4. (12) Ty Dillon, Chevrolet, 150, $14235. 5. (9) Matt Crafton, Toyota, 150, $14160. 6. (6) Cale Gale, Chevrolet, 150, $9310. 7. (26) Ryan Blaney #, Ford, 150, $12510. 8. (7) Johnny Sauter, Toyota, 150, $11460. 9. (4) James Buescher, Chevrolet, 150, $12410. 10. (16) Chase Elliott, Chevrolet, 150, $12610. 11. (24) Jeb Burton #, Chevrolet, 150, $11160. 12. (11) German Quiroga #, Toyota, 150, $11035. 13. (14) Daniel Hemric, Chevrolet, 150, $10985. 14. (23) Steve Wallace(i), Chevrolet, 150, $8660. 15. (5) Max Gresham, Chevrolet, 150, $11935. 16. (18) Timothy Peters, Toyota, 150, $10785. 17. (8) Ryan Sieg, Chevrolet, 150, $10735. 18. (22) Brennan Newberry #, Chevrolet, 150, $10685. 19. (25) Dakoda Armstrong, Chevrolet, 150, $10635. 20. (13) Darrell Wallace Jr. #, Toyota, 150, $11210. 21. (19) John H. Nemechek, Toyota, 149, $8235. 22. (27) Mason Mingus, Chevrolet, 149, $8185. 23. (28) David Starr, Toyota, 146, $9085. 24. (33) Norm Benning, Chevrolet, 144, $8985. 25. (32) Jennifer Jo Cobb, RAM, 137, $8035. 26. (10) Joey Coulter, Toyota, 134, $7785. 27. (15) John Wes Townley, Toyota, Accident, 119, $7660. 28. (21) Ron Hornaday Jr., Chevrolet, Accident, 85, $7560. 29. (36) Chad Frewaldt, Chevrolet, Electrical, 66, $7460. 30. (35) Steve Smith, Chevrolet, Axle, 65, $7860. 31. (17) Miguel Paludo, Chevrolet, Accident, 34, $7310. 32. (30) Chris Jones, Chevrolet, Brakes, 14, $7285. 33. (31) Bryan Silas, Ford, Engine, 10, $7260. 34. (34) Mike Harmon(i), Chevrolet, Oil Leak, 3, $7230. 35. (29) JJ Yeley(i), Chevrolet, Accident, 2, $7195. 36. (20) DJ Kennington, Chevrolet, Accident, 1, $7153. Average Speed of Race Winner: 88.743 mph. Time of Race: 1 Hrs, 41 Mins, 25 Secs. Margin of Victory: 1.616 Seconds. Caution Flags: 7 for 42 laps. Lead Changes: 6 among 3 drivers. Lap Leaders: R. Chastain 1-37; B. Gaughan 38-40; E. Jones 41-89; R. Chastain 90-93; E. Jones 94-119; R. Chastain 120-141; E. Jones 142-150. Leaders Summary (Driver, Times Lead, Laps Led): E. Jones 3 times for 84 laps; R. Chastain 3 times for 63 laps; B. Gaughan 1 time for 3 laps. Top 10 in Points: M. Crafton – 780; T. Dillon – 734; J. Buescher – 730; J. Sauter – 703; J. Burton # – 690; R. Blaney # – 682; B. Gaughan – 677; D. Wallace Jr. # – 675; M. Paludo – 664; T. Peters – 648.